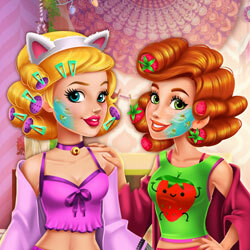 Description: Audrey and Jessie, our two beautiful fun young fashionistas have decided to join forces in this beauty makeover and try a new style: boho-chic! First they'll put their hair on rollers to apply face masks and clear their faces of any imperfections. Next they'll need your help for makeup, choose colors that fit them well!. Finally it's up to you to decide which are the best outfits to match this flowy, frilly, gorgeous style!